If you're unable to attend the hearing this Wednesday evening, please email the Town of Gibsons and let it know you support this development. Write your email or use the example below. I very much support the application to rezone the EagleView Height site to allow the 87 suites proposed. Jobs will be created, infrastructure will be improved, and the new tax base will help to provide the controlled growth needed to continue to make Gibsons the best place in Canada to live. EagleView Heights will be beneficial to all! Thank you for your commitment to our Town. 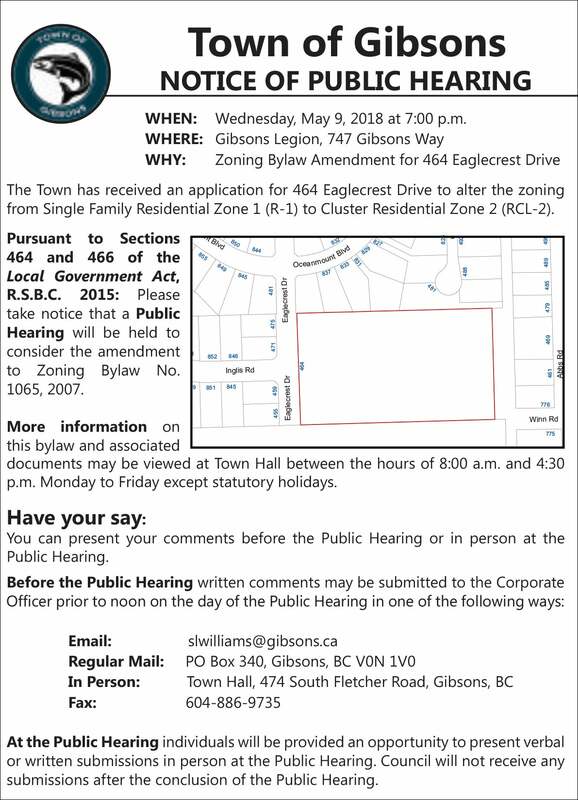 There’s a public hearing for the EagleView Heights real estate development this Wednesday May 9th at 7pm and it will be held at the Legion on Gibsons Way. I invite you to attend the hearing and voice your support for a project that will create employment and begin to address the current housing crisis on the Sunshine Coast. Having been involved with this project since the beginning, I can say this is a responsible plan that has incorporated input from the community and is a development of which we can all be proud. In addition to jobs and much needing housing stock, EagleView heights will provide infrastructure improvements and expand the town’s tax base. These benefits will contribute to the controlled growth required to maintain our high quality of life. If you’re in favour of creating employment and increasing the housing supply, please attend the public hearing this Wednesday May 9th at the Legions in Gibsons, BC and make your opinion heard.